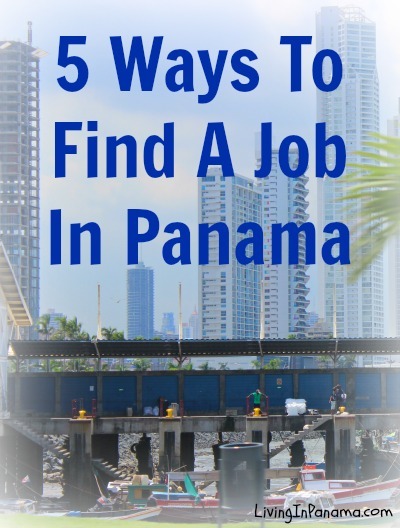 Finding a job in Panama, especially at good pay, can be a challenge. I think the best option is to create your own job in Panama. But that option does not appeal to everyone. Keep it in mind though, in case your job search does not result in your dream job. Don’t forget to tell everyone about your search for a job in Panama. Especially if you get a just-for-now job, keep networking after you move to Panama. You will probably hear about many open positions through word-of-mouth. This is the easiest way. Just do the job your doing, but on the beach. If you are willing to shell out the cost of semi-regular plane trips to be in the office in person, it makes it much more likely. Given the lower cost of living in Panama, you may end up making more money even with the plane tickets. I know people who do this. I even know people who do this for a business they own “back home”. Just ask, the worst that can happen is they say, no. If you really want it, then address all the reasons for their no. Keep showing them their reasons are wrong (if you can) and they just might say yes. Does your company have an office in Panama? Look for internal job postings that offer relocation to Panama. Convince your bosses why they should send you to the Panama office. They may finally send you just to shut you up. Yes, you can work in Panama for an international company at a western salary. There are more than 100 multinational companies with offices in Panama. Panama is a business hub for the region. Marriott, Dell, Coco-Cola, Hewlett Packard, Kimberly-Clark, Caterpillar, Nestle, Proctor & Gamble, General Electric, Citibank and many more have branches in Panama City. Research companies in your country with an office in Panama. Convince the company that you have a skill they need, especially that they need in Panama. It must be a valuable and somewhat unique skill. If someone in Panama is available with somewhat the same skill, they will use that person. You can also work for NGO’s originating in your home country or international organizations. In fact, the NGOs there have their own website, which includes job opportunities. For Current Job Opportunities at NGOs in Panama City, go here. If you decide to look for a employment with a big company, you are also deciding to live in Panama City. Almost all the large companies offering western salaries are located in Panama City. Go back to your lifestyle goals, does living in Panama City fit in with those goals? Expats work in a wide range of Panama companies: banking, journalism, education, construction management, sales, web design, marketing, and more. Obviously, you will need to know Spanish somewhat well to pursue this option. Look for a company with hardly any foreign employes. Panama restricts its companies from hiring “too many” foreigners. What they mean by too many is more than 10% (sometimes 15%) foreign employees. If you can find an company with less than 10% foreign staff, they could legally hire you. Of course, you still need to convince them of that and get a work permit. You can also get “specialty” work permits that last 3-9 months through certain organizations. Go here to read about work permit options in Panama. Make sure you are okay with the salary before you try to get the job. Most Panama companies pay well under what the same work would pay in the western world. One way to make sure you can live where you want, is to get an online job. There are more and more of those these days. Go to this post for more information on looking for a job online. Language schools sometimes offer work opportunities to foreigners. However, they don’t pay that well and it is hard to find a full-time job. But it could be a great temporary job. Then you can look for more lucrative job once you are in Panama. Like language schools, both tourist hotels and tour companies need to hire English speakers. You are more likely to be hire if you can other, especially unique, skills they need. There are some private recruitment agencies. But they don’t usually pay well and they tend to offer short-term work. Two agencies to try are Adecco or Manpower . It is important to think about your ideal lifestyle, before you start working. Otherwise, you could find yourself in another job you hate. One that keeps you from enjoying the lifestyle you can down to Panama to enjoy. Check out this create your lifestyle & make money post. Can a non-citizen work as a marine engineer or is that included in the list of engineering jobs reserved for Panamanian citizens? Licensed Journeyman plumber and gas fitter looking to migrate and work in Panama. Any positions available. Will get anu visa required.